How to Return Your GoPro for Replacement within the 1 year Warranty Period. Home /How to Return Your GoPro for Replacement within the 1 year Warranty Period. I am not sure why but when I checked the GoPRO User Philippines, it seems like I am not the only one who has the same problem. A lot of users often wonder what they should do next? I know my GoPro is still under 1 Year warranty. I asked many users and each one of them has their own version and it’s hard to read long threads so I decided to write about how I returned my GoPro for replacement and how we exchanged emails. I was really impressed with the GoPro Support! 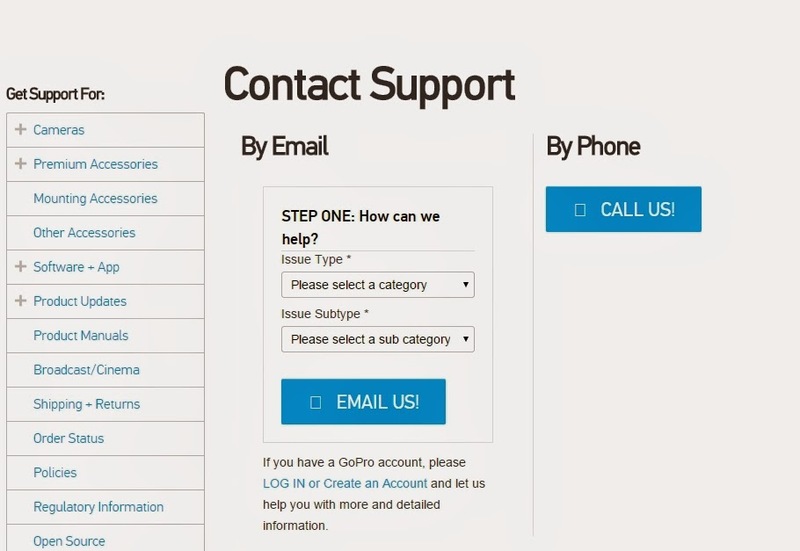 You need to email the support right away and tell them the issue. Once you emailed them, you will receive an email notification from GoPro Support with the Inquiry Case No. They emailed after 1 day and requested for the picture of the item with the cracked case. After a few hours, they emailed back with this. NOTE: TAKE NOTE OF THE 2ND PARAGRAPH! NOTE: PLEASE MAKE NOTE OF ALL THE CAPS IN THE EMAIL. THEY ARE VERY IMPORTANT! I decided to contact UPS since they can pick it up and send it to Singapore for replacement. UPS will ask you to put it in the box and ask for the weight and dimension of the package. Their minimum weight is .5 kg ( Half Kilo) which costs around PHP 1500.00 including the pick up and delivery to Singapore. Better phone in the morning so they can pick up in the afternoon. 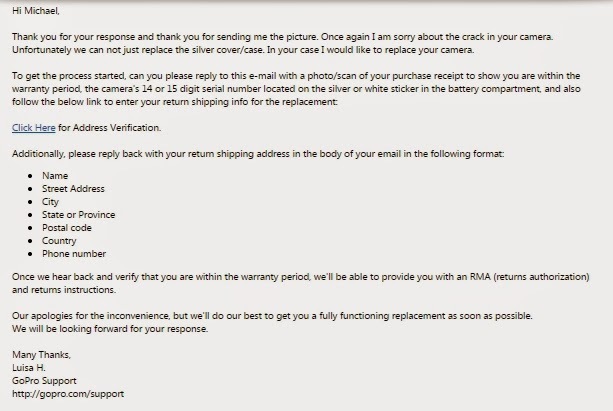 I got very confused on how to send the cracked case camera so I emailed them with the question: “Can I send my camera to any local courier?”. Here’s their reply. A. I RECEIVED SOME INFORMATION THAT ONCE YOU CLICK THE UPS LINK SENT BY GOPRO, YOU DON’T NEED TO PAY ANYTHING FOR THE COURIER. B. PLEASE MAKE NOTE OF ALL THE CAPS IN THE EMAIL. THEY ARE VERY IMPORTANT! Once they received your item, you will receive an email like this. And soon after, you will be receiving an email with the UPS tracking number. 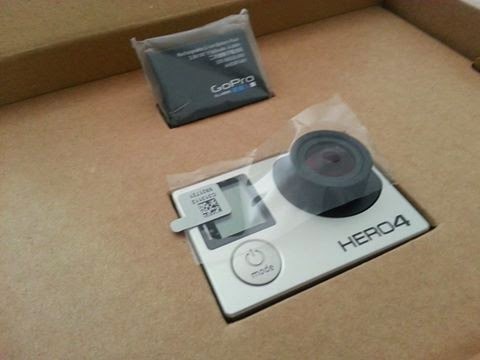 March 31, 2015 – I recieved my GoPro! I really thank the GoPro Support specially Luisa for being so helpful! Their response was very quick and she handled the case well from the start all the way up to when I received the new unit. Did they include a battery to the replacement unit? Thanks for this blog! now I know what to do when mine gets broken. I have no trust in our local resellers when it comes to this kind of problem. Thanks for this blog…i have freezing issue on my Gopro…i followed the steps after reading ur blog…now i hv received the RMA Form.. Thanks a lot..
Hi! When did you ship your item? I just shipped my camera today and I am hopeful to receive the replacement before april 30. I shipped it 3 days before the 20th of March. I phoned UPS and ask for the tracking number whether it was recieved or not. And I also emailed the GoPro support to notify them that I sent it already. So after they have received you return on March 20, it took them 9 days to process and ship the replacement? Yes, normally it takes only a few days but they were honest about the fact that they ran out of GoPro stocks. That's why mine took longer than anticipated. Hi ANgelo, where did you bought your gopro? if i bought it in camera haus, will the gopro support honor the item? Hi I bought mine at Alabang Town Center last December. They will accept that as long as you provide them with the copy of reciept and the numbers or serial numbers inside the camera. They will advise you as long as it is within the warranty period. Hi why not send it to the service center in the Philippines? Is it better to send it to singapore? Do we have a service center in the Philippines already? My camera is still under the warranty and Singapore is the nearest service center who can replace my camera. I've never heard any direct service center yet here in the Philippines. We have the same case of damage. I already talked to Camerahaus, they said that i need to bring the unit to the service center, it's Mudovi. When I called Mudovi, i found out that they are one of the GoPro distributor here in the Philippines. They mentioned that the damage is not part of the warranty, since I have a hinge that they will not help me, i emailed GoPro support instead. Got my case no. and waiting for their reply. Please let us know what they said. It's really better to contact the GoPro support in Singapore as they can tell you whether they will reply it or not under the warrantly. Good luck! See that "UPS SHIPPING LABEL" ? Hi, Thank you so much for the additional information. 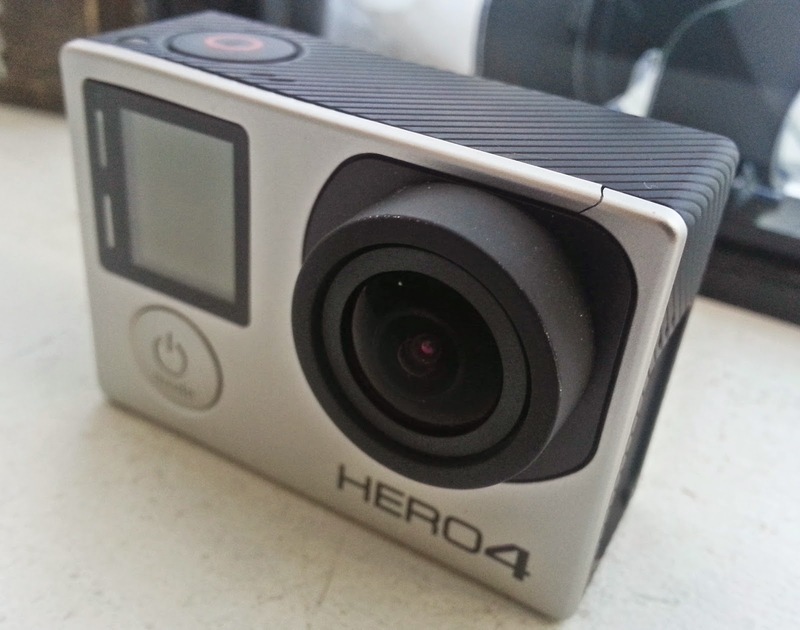 I am sure this will help a lot of GoPro users around the Philippines and in Asia. If unit was bought without the "one year warranty" indicated upon purchase (like most online resellers in the Philippines), will GoPro still honor the claim within 1 year from purchase? I think they would! They just want to look for the copy of the reciept and the numbersin your GoPro camera just to make sure it is within the warranty. thanks for your blog! very helpful! is your newly replaced camera in good working condition so far? Hi I called the UPS and the were looking for the Invoice declared value. Isn't that the RMA Form already? Hi Jose, I really am not sure about Invoice declared value. UPS Picked it up at our house and referenced the RMA Auth on the box and also inside next to the camera. Hi your blog was really helpful ! How about if i lost the receipt ? What can i do ? I lost my receipt too that's why I phoned the shop where I bought it and they took a picture and sent it to me which I later sent to GoPro Support and they acknowledged it. You may just ask for a copy of reciept if you know where it was bought in the US. Dude same thing happen to me contact the store in the US if they can send you a copy of the receipt. If you can't get a copy send an email to go pro support about your case, they will be happy to help you. Hope this helps. Hi Angelo, Did you use UPS as your courier? did you pay the 1500 mentioned on your blog?What I know RMA should be free. if you did not use UPS what courier and how much did you pay? thanks Angelo! Yes, I used UPS and asked them to pick it up from our house. I phoned them and they quoted me that price which I paid when I handed in my GoPro. You can use any other courier services for almost the same price as Php 1500.00. I am not exactly sure. It is better to phone UPS . Someone made a comment last June 14, 2015, please check the comment thread to find out how courier can be at no cost. I lost my receipt. I bought mine in Henry's Trinoma (Philippines). Do you think the shop will be willing to give me a copy of the receipt? Hi do i have to pay for the amount on the commercial receipt? UPS is gonna pick my unit up tomorrow.. i called them regarding the pick up buy they didnt mention anything about me paying for the shipping fee.. hope i can get a clarification.. because the amt on the commercial invoice is almost a hundred dollars..
Hi Pau, we paid the courier fee to the person who picked up my unit in the office. I'm curious about how you packed your Go Pro for shipment. How do you guys do it? What are the things written/sticked outside the box? I put it in a small box. Actually I put mine in a chocolate box and included the RMA form they sent you. You can use any small box to put your GoPro. If there are some spaces in the box, just put tissue or paper so it doesn't shake too much during shipping. That's what I did. hi angelo. did you choose Philippines or Singapore as the shipping country? I'm quite confused with that. Hi Jr, the address I used to ship my GoPro was the one in Singapore and addressed it here in the Philippines.for shipping. So from Singapore, they shipped it here in Cavite, Philippines. 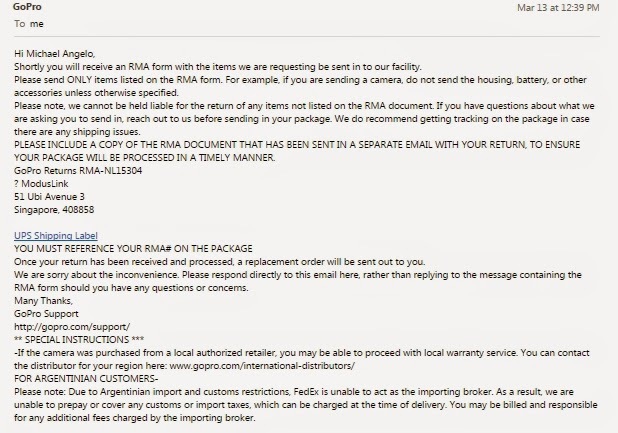 I checked on the dates of the images I had posted and the initial email from GoPro was last March 30 and after two days, I recieved the email with the tracking number . Just have to wait for a bit I am sure they will email you with the tracking number. how many days it took for them to replace? Normally it only takes a week maximum but on my case, they ran out of stocks so it took 2 weeks. can i ask what courier did you use to send the camera and what address should i put? Hi Richard, I used UPS as a courier. From the Philippines, I sent it to Singapore via this address Address. DO not forget to reference the RMA # too. Hello! Thanks for sharing this! How do you packed your Gopro? When you ship it to Singapore, all they want is the unit. Batteries and case and other accessories are not included in the shipping. Only the unit itself. I basically put it in a small box and put paper around it so it doesn't shake. Hi Angelo, thank you so much for this blog. We have the same issue with regards to our gopro. I now have the RMA. But when I filled up the UPS Shipping Label, it says "missing or invalid ship from StateProvinceCode". I'm from Southern Leyte by the way so maybe it says invalid because we have no UPS here. Can I send it to other courier right? We only have LBC, 2GO and JRS Express here. I double checked that with the support and they said that you can use any courier service when sending it to Singapore. Hi Charmagne, it is really difficult to say kung saan ang problema whether sa phone or sa GoPro. Did u try pairing it with other phones? My advice is to message the GoPro support with regards to your concern. I am sure they will have the answer to your question. Thanks Charmagne! I'm from Russia, we have exactly same forum. He asked exactly same questions. And I did exactly as author (Angelo The Explorer) – camera GoPro be broken and GoPro service was very helpful, sending me a new camera, thank you personally for help Chase! However, there is little question. Probably, it is important to everyone. What is warranty on a brand new camera that we got from GoPro? That is a very good question and to be honest I don't know how to answer that. But based on my own opinion, warranty still applies from the date of your purchase since they will based on on the receipt and not on the brand new GoPro. So if something happens again with the new camera that needs to be replaced and within the year based on the date of purchase of your original GoPro, I think it is still covered. Again this is based on my own opinion only.. It is better to ask the GoPro support to get a concrete answer. Thanks! "The replacement's warranty period is 1 year from the date of purchase of the original camera." hi po sir angelo. tanong ko lng po sna. if ni replace ni gopro ang unit, icocovered pa kaya ng service center dito sa PHP ang irereplace nilang unit kasi mapapalitan na ng serial ung unit dba.? covered pa kaya sa local warranty kapag ganun? and last question po. nung nag process po kayo for replacement nya ilang working days po or ilang weeks po inabot bago dumating ung unit po? thankyou po sa info. Hi Charlvin, I checked on the the service center dito sa Pilipinas pero walang nasagot sa phone number number. I think they all look at the receipt where it was first purchased in regardless sa serial number. Before dumating sakin ung unit, it took more than 2 weeks dahil naubusan sila ng unit. But they support notified me by email and kept me updated of the progress. Have u tried contacting the support of GoPro? Hi Angelo! Can I ask what courier did you use in sending your camera? Mine broke exactly like yours, I sent an email to GoPro staff and already sent it via UPS in Brazil. Hope there will be a solution to replace the faceplate, as mine never dropped to ground. On the day they received the package, did they immediately sent you a message with regards to receiving it? Nope they did not, I made a follow up and I called the UPS and they confirmed that it was received by GOPRO. How much did it cost you to return the go pro? I wish I could remember but its over Php 2000 pesos. I'm getting mixed info here reading the article and the comments. So do we pay for anything to return the unit? Also what is included in the return? The camera, commercial invoice, filled out RMA form and the return label? Hi Simon, on my case I paid for the courier but there were some comments and a friend of mine said that once you clicked the UPS link sent by GoPro, you don't need to pay anything and UPS will just pick it up from your place. I included the camera ( not the battery), invoice, rma form and that's it. 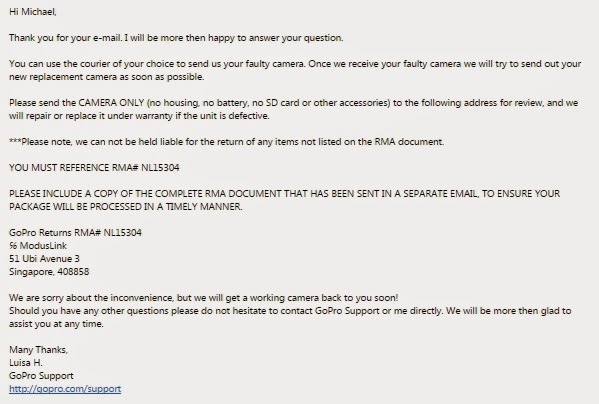 to be sure it is best still to ask the GoPro support if there are any additional info. hi i lost the receipt of my go pro and it was a gift and no idea where they bought it.. can gopro support still verify its warranty using the serail number of the unit?. I am not sure about that. When I showed them what happened to my GoPro, they asked for a proof of purchase. We didn't have the reciept so we contacted the store where we bought it and ask for a copy of reciept. Better ask for the receipt just in case. Hmmmm not really sure about transaction number sinceI havent surrendered my gadget to them yet. I just provided them with the RMA. It is best to ask them what they mean about that. what kind of box/package did you use in sending your gopro? I just called UPS, they are asking for a commercial invoice from gopro. But gopro only emailed the RMA form and nothing else. Did they also ask you for the commercial invoice? I used a chocolate box. Just small enough for the unit to fit. I just put added some cotton so i doesnt move in the box. Hi. Kamusta po yung replaced unit? Hindi na ba sya nagccrack? Good. Pano nyo sya sinasara sir? Marami kasi ako nababasa about dun sa crack. Very common siya. Any tips? Pag di nyo po ginagamit nakatanggal ba sa case? Before I close it po, I make sure na flat ung camera sa case before I close it. Kasi that is what causing it to crack for me, is when its not closed properly po. Hi Angelo! Will GoPro still honor the warranty even if I bought mine from an online seller? They just offer an acknowledgement receipt since they don't have a physical store or official receipt. Thanks for the info! I am sure it is fine as long as you have the receipt when you purchase it. The acknowledgement receipt should be fine but to be sure better ask the GoPro Support po if they will accept it. Hey, i was just wondering if it exceeds the 1 year warranty, di na ba nila e.rereplace? I bought mine last year, February and it was in the water proof case for 3 months na. I just found out right now that it has this crack at the upper left side. Any idea if e.rerecognize pa nila? Thanks for this Angelo!! This is very helpful, you mentioned that there's no payment for the ups right? Also, how does your packaging looks like when you returned it? On my case I paid but browsing through other comments of the users once you click the link in the email about UPS Courier, then no need to pay. When I returned it i just used a a very small box which you can get at any bookstores. I added some cotton around it so it doesn't shake too much. Thank you for sharing this Mr. Angelo! Your blog was really helpful! Sir just want to ask.. nadaplisan po kasi ng gulong ng kotse ung goproh4s ko, damage ang outer lens and back lcd.. but all are still working well.. still under warrant.. pede ko po ba pa ayos sa gopro support? Di po siguro siya covered ng warranty.. anu po ma advice nyo? Hi angelo may additional warranty ba yung replacement unit?kasi kung nagpareplace tayu then expired na yung original warrantym yung new unit ba magkakawarranty dn?kasi possible may defect dn sya ehh.thanks. Naku I cannot answer that question po. Better to send an email to the support po since they are the only one who can answer that po. Hi Angelo! Thanks for the info. Just wondering, where did you purchase your GoPro? If I purchase GoPro locally, will it be covered by the international warranty? Thanks! Thank you Angelo for this info. i already sent my gopro to singapore free of charge via UPS. Thanks great to hear po! I am sure you will have your new unit plus a battery in the coming days! Paano po kayo nagsend through ups? may iba pa po bang hinanap sa inyo bukod sa rma? What I did was I phoned UPS to pick up the Gopro sa house with a fee and un po. Basta naka attached lagi ang RMA po. rma lang ksi yung sinend sakin ni gopro then yung link na nakalagay e nageerror kapag nilagay ko na yung details ko. I think it is best po to contact the support as they are the ones who can tell you what to do with the shipping po. I am very pleased to hear that Eleanor! Did the gopro support tells the reason or cause why it happens? I had the same damage exactly at the same spot on my hero 4 silver. Thanks to this informative & helpful blog. They didn't really say as to why. I dont think they will admit if there was really a defect on the case. But, what is important is that GoPro will replace a crack damage like that as long as it is within the warranty period. Hi Angelo! Thanks for the post. This helped me a lot! I got the same issue. I am already talking to the gopro customer support. They are asking for the proof of purchase, did you just send the receipt? I noticed that my receipt doesn't indicate clearly that the camera is a gopro cam, it just says sports camera. I was wondering if you have provided any proof of purchase aside from the receipt? Thanks! Hey, tanong ko lang f brandnew unit ang nireplace nila or same unit lang yung pinadala mong gopro (the same item and they fixed it) or refurbished na? Hi Angelo! I have an issue with my gopro, tried every solution i found on the web but nothing worked. I bought it from kimstore, do you think gopro would honor the receipt from an online store? I just sent my GoPro for return shipping via the UPS to Singapore, however, the tracking status says there was a "mechanical failure has delayed delivery. We're adjusting plans to deliver your package as quickly as possible. / Delivery will be rescheduled." Did you also experience this same status? Well not exactly same issue but there was a delay when I received mine because of they ran out of stocks. UPS mailed the camera successfully and it was the GoPro who delayed everything due to no stock available. Dont worry I am sure it will be delivered and you will get a new unit soon plus a battery. This blog is really helpful. I have the same issue and just followed your writeup and bwallah. They will send me a new one. I'm hoping that they will send me a Hero5 instead of Hero4. To others who have problem with the glass at the back of their camera, just be kind to their customer service and tell them the truth(if it broke on it's own). I was initially rejected through email so I decided to contact their US customer Service. These guys are very helpful. I spoke to Charles and his supervisor Victor who helped me with the steps and now I will just send the defective camera and get a new one. I got a message to UPS that my item was already delivered in SG. That was last Feb. 1. But until now, i still have not recieved any email to GoPro. How long does it take for them to email me that they have already recieved and shipping the new replacement? Angelo said that it takes a week or 2 for the replacement depending on available stocks. Hi, i brought Hero5 last December9, 2016 and tried capturing for practice with only few trialson the next day only. Afterwards, I used it on December 23 during our getaway Vacation in Bohol,Philippines performing without submerging it on water scene. A day after, we traveled in Oslob, Cebu to do Whale watching adventure which accumulates 30minutes alloted time for viewing. Then, we Visited Sumilon island which was located nearby and my friend noticed that the Hero5 was totally drowned even if it still functioning. So, we quickly turned it off and remove all the accesories (battery and sD). I didn't use it since then. I just attempted using it on December 29 when I visited Ultra Wind Mountain resort located in Bukidnon. it was still functioning except it cannot be turned off on its button and it states that it doesn't have a SD. I observed that the SD insertation malfunctions too even if i inserted a new-purchased SD. On January 6, 2017, i complained my situation to the store, Camerahaus, SM General Santos, to where i Purchased it. They shipped the item in Manila for Solutions and repair. It was last friday, February 10, when they told me that my Hero5 arrived and GoPro Manila can't fixed it due to huge damage on its internal parts as rust runs all over. I emailed the GoPro International and have not yet received any response. Can somebody advise me what should I do next. Hi sir! Nreceive nio n po b un go pro camera nio? March 4 nmn po nun pinick up ng UPS dtons tarlac un cam. For free lng po.. Basta dpt mkuha nio un return label.. Thank you! for doing this blog. it really helped me a lot. Thank you sir, nagreply na po ang gopro support sa akin. Im about to send my information for my hero 5 na nagblack screen. tapos wait ng RMA. I almost lose hope na po sa camera ko. thanks po. nasa akin na po ung RMA ko. ano pong company ung ilalagay ko sa link na ito: https://gopro.upsrow.com/post.php? tapos sa address po, ung address po kung san ipipick up ung camera? tama po ba? Hello, Sir Angelo. I have the same case with you but will they still replace the GoPro even if it's beyond the warranty period? I purchased mine way back 2 years ago. Thank you. Hi Sir Angelo, May problema po ako sa GoPro, GoPro ng pinsan ko. Hiniram ko po yung GoPro Hero 5 niya for some reasons, then ginamit ko po kahapon sa outing namin. Ginamit ko po siya underwater without case po ha, then suddenly bigla po nag-SD card error and bigla po namatay. Akala ko po lowbatt lang but when I charge it po ayaw na magopen ng screen niya. Nagblank screen po siya. Nung una po ayaw mag-open then kanina po mga bandang 4:00 pm inopen ko po tapos ikinonect sa Capture App gumana naman po yung camera pero yung screen po talaga ang hindi gumagana. Natatakot po ako at hindi po akin to, hiniram ko lang po sa pinsan ko. Regalo pa po to sa kanya ng boyfriend niya. Ano po pwedeng gawin? Nag-email na rin po ako sa GoPro Support. Sana matulungan niyo ako. Hi, allow me to reply since naaamaze pa din ako sa service ng GoPro Singapore. Okay pa ung sayo kasi naconnect mo sya sa Capture App, saken wala talaga. as in black screen sya. Regardless of the pick-up and delivery journey, ung mismong stay lang ng cam ko sa gopro office was less than 24hrs. Today will be the delivery date ng gopro ko. Parang tumapak lang sya saglit sa SG tapos alis na agad. Mejo tumagal kasi dumaan ung weekend pero kung nabigay ko sya agad ng Monday, probably Thursday naibalik na saken. Nagvisit ako sa link ngayon ng contact us pero wala na yung via Email na option. Is there other way? @Angel, I advise leaving the "I want to discuss an existing case" tick box unchecked. If you have an existing case filed this won't be a problem as the support agents can track it using the email you have provided with them. Is it normal to wait for a few minutes to start a cht with an agent cuz it says here that "HANG ON WE CONNECT YOU TO AN AGENT"
Hi! Tumawag po ako sa Air 21 hindi daw sila pwede magdirect pick-up ng package ng walang email yung UPS sa kanila? Hi. Ung box po ba na pinaglagyan mo ng GoPro is yung lagayan mismo ning binili mo yung unit? Papadala ko rin kasi unit ko for replacement. Thank you. Quick question. Has anyone been offered the 40% discount for returning an GoPro unit (defective) but is already out of warranty? They confirmed that the 40% is deducted from the price from their official website of the GoPro you want to purchase. Quick question, if I buy a unit, do I shoulder the shipping fee (which costs around 4k?)??? Also, how do you reference the RMA# outside the package? Do you write it on the box itself or paste the Electronic Return Label Receipt sent from the email? Go pro also offered me 40% discount. May I ask what happened to your transaction? I had already sent my camera to Singapore awaiting for their confirmation/advice regarding this. Hey Angelo! Is it just me or they no longer have the Email Us option? Would love to hear from you and other users. Hi! Oh I havent checked on it yet. But I am sure other users would be able to answer your question. Hi! Ask ko lang anong postal code ginamit mo? I keep getting an error na Missing or invalid ship from StateProvinceCode eh. hello angelo. I already finished the steps on how to send back the Go pro but I got a problem because we dont UPs courier here in our region.Do they acknowledge other courier to send the unit?like DHL? or maybe can I get my new gopro unit to which Ive been purchased it?